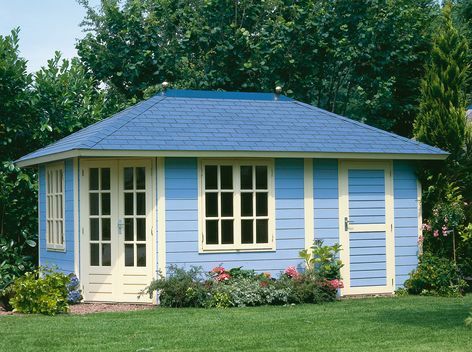 The Lugarde Fifth Avenue Duo Series has an internal wall designed to allow people to use their summerhouse as a place to sit in as well as storage for garden tools etc. The partition wall may be removed leaving short stubs on each side, to create a large single room. All Prima Fifth Avenue Duo models can also be built in reverse but must be specified at time of order. 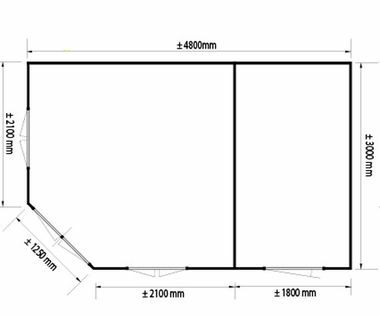 Size approximately 4.8m x 3m in 28 or 44mm log thickness. The standard Package includes 2 casement windows PE21 (outward opening) a double door PE22, a single door DD01 and an internal wall. Measurements are taken to the outside faces of the walls. Please Note: The partition wall is to eaves height only. If you require a ceiling over the store room, this can be achieved at extra cost.